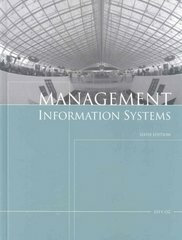 Management Information Systems, Sixth Edition 6 Edition With a clear emphasis on the business and management elements of information technology, Management Information Systems, Sixth Edition continues to be the ideal resource for upper-level business students and MBA students. Updated to include the latest information technologies, practices, and trends, this book uses more real-world examples and case studies than ever before, providing skills and knowledge that are easily transferable to the business world. From overviews of the information age to online business and business intelligence, readers will gain a sound balance of the technical and business elements of information technology.